Every sales team has a mix of different personality types. As leaders and sale’s managers we have to work at managing and coaching to each individual to optimize performance. The easiest approach to managing sales people is a broad-brush performance and or activity perspective. This will reap average performance because its an average performance management system. This lack of specificity in coaching fails to address the different work styles, attributes, experience, objectives, and motivations. This results in a lack of new ideas, a lack of effective collaboration, deeper and more meaningful learning is missing, and performance becomes a challenge. To get above average performance, you need to manage and coach using an above average process. To do that you need to coach to the individual. What motivates one person does not motivate another. I believe that for sure reps need to be self motivated, that’s an obvious given. But to get the extra mile from your people, to receive exceptional effort, it helps to ensure they are being supported and coached in a way that increases their intrinsic motivation, not hamper it. I have read from some sales experts that say reps need to be self motivated and we can’t as managers influence them. Hire motivated reps, and fire unmotivated reps, while that is partially true, I don’t entirely agree. I have seen highly motivated sales professionals become disenchanted from lack luster sales management. In a tight labor market I would not want to make that assumption. I know from my own experience, I was a highly motivated and driven sales person. That was inside me and no one could take it away. But I would go the extra mile, put in the extra effort, and stay longer when I was working for someone that I looked up to and felt supported by. One of the steps a leader needs to take is to determine what makes each of his or her people tick, what’s important to them, what style are they, how do they learn, and what motivates them. Assessments are also a great asset to help in this process. HBR published an article on the topic of managing to different personality types by Suzanne M. Johnson Vickberg and Kim Christfort (April 2017). 190,000 people completed their assessment and they described the results and how you can capitalize on cognitive diversity. It clearly works. Specific coaching is an underused tool that offers superior results. It’s one of the most important transformative elements of effective coaching—coaching to the individual. Are you coaching to your individual team members? Feel free to comment. 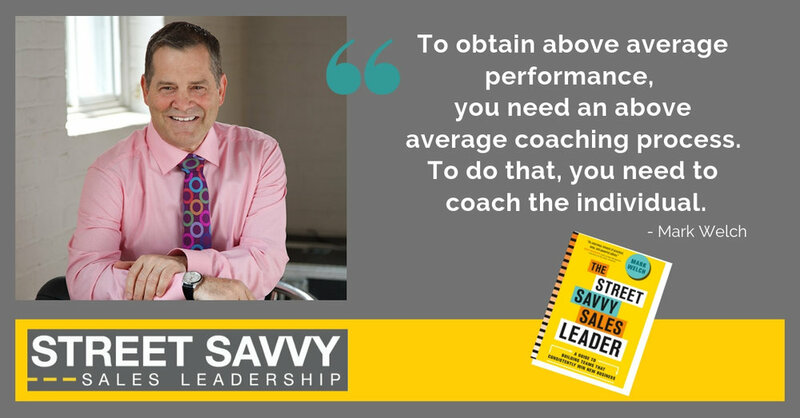 For more information and insights in regards to coaching and other sales organization thoughts refer to my website, www.streetsavvysalesleadership.com, feel free to order my book, The Street Savvy Sales Leader, A Guide To Building Teams That Consistently Win New Business. For individual sales or sales leadership coaching, workshops, contract work, speaking or consulting feel free to contact me. "Erosion of trust"-A very public lesson for all leaders!